There's an awful lot to like about skiing in New Zealand. Epic terrain, empty slopes, cool locals and interesting, low-key ski areas. But there's not denying that conditions here can be tricky. The best skiing in NZ is August and September. September typically has the most snow, but it gets pretty warm from mid September onwards, so it's hard to ski powder. August is the most reliable option for winter conditions. Officially, the season here starts in June. Keep in mind that the club fields don't have snowmaking or grooming, so they're absolutely reliant on natural snowfall to open. Plus, rope-tows need enough snow on the tow-lines (where you get pulled up the slope) to open, so they need decent coverage to get started. Less than 50% of the last 6 seasons have opened in June. If you plan a trip here in June, there's a very good chance you'll end up sitting around in town, or skiing a strip of man-made snow down a groomer at a commercial field. Asahidake ropeway is only an hour or so from Hokkaido’s second biggest city, but it feels a very long way from anywhere. As you drive up, the mountains fold in around you and the ever-rising snowbanks on the roadside make it clear that this place gets serious snow. The ski area is sheltered and calm, collecting deep, dry powder while up above the big winter storms buffet the peak of Mt Asahidake, the tallest mountain in Hokkaido. Asahidake has one cable car, and like Kurodake, this was set up for hikers and tourists visiting the hot springs in summer. 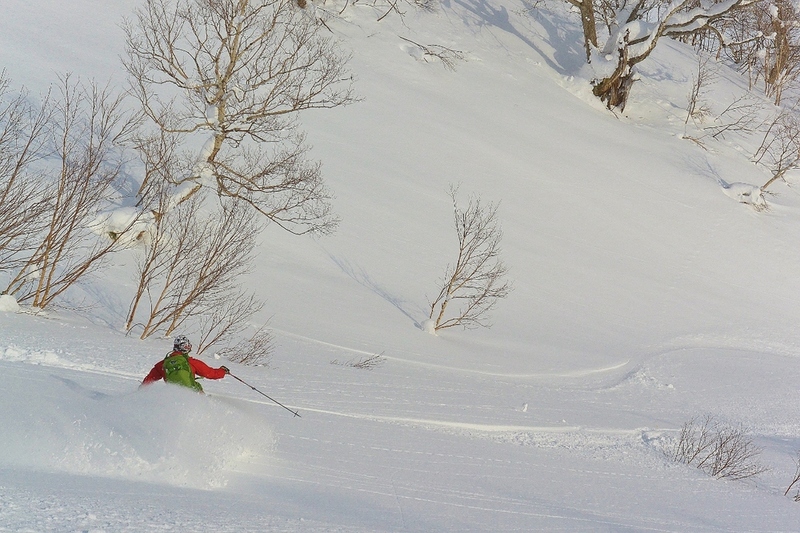 But over a long winter, Asahidake gets hammered by metres of the driest snow in Hokkaido. This area is for those who love riding through trees and enjoy a little exploring in search of the perfect run. Around the base of the gondola are a handful of hotels and ryokans that mostly cater to summer tourists. In winter they’re quiet, welcoming the few guests they receive with warm hospitality, amazing traditional Japanese meals and outdoor hot springs on the edge of the forest. One year ago, when the Powder Project was just a few scribbles on Pete's whiteboard, I came to Hokkaido to start figuring out where, when and how we'd take people around this incredible island. The "recon trip" was a troubled idea from the outset: I had no money, no contacts, and was recovering from an injury. My kneecap had been smashed into seven pieces during an end-of-season ski mountaineering jaunt in NZ a few months earlier, and it wasn't clear whether I could even ski. But I'd agreed to drive a bunch of friends around as a sort of trial-trip, so I bought some heavy duty kneepads and got on the plane. Mostly, that trip was cold and painful. It turned out I couldn't ski - I rode a few groomers here and there, but it wasn't pretty (a CT scan shortly after I got home showed my kneecap had a hole in it). I was sleeping in the back of a Subaru Imprezza, which was just long enough to stretch out in and just cold enough to be unrelentingly miserable, and I spent my days driving around, checking out ski areas and towns, meeting people and practising my Japanese. After a week or so, Pete and the rest of the group turned up for 10 days of skiing, so I moved out of the car and into hotel rooms as I sorted out the logistics for the trip, helped them find ski gear, and cut seemingly endless sets of skins. I ski because it's fun, but also because it's a way to be in and move through the mountains. I might have been hanging around mountains that trip, but everything felt a very long way away. Then we got to Kurodake. We turned up at the ropeway on a perfectly clear day and once the group had headed off with their guide I caught the cable-car up to the top station to have a look around. You can read the details in our Resort Write-Up which I'll post later this month, but in a nutshell, Kurodake is a mountain in the Daisetsuzan National Park in the middle of Hokkaido. It's next to a town called Sounkyo, and it's a beast. One side of the mountain is a system of jagged black bluffs that drop hundreds of metres from the craggy summit to a tight and twisting drainage below. It's not really a ski field. There's a ropeway running up a ridge, with a short chairlift and a few flat groomers at the top. You can ski back down the ropeway, through a series of steep gullies and tree-covered faces that work their way through the bluffs. People also hike up from the chairlift to ski a long, open pitch below the summit. But from the observation platform on the top-station of the ropeway, you can see past the peak and into the head of the drainage northwest of the mountain. Steep chutes drop from the ridgeline into the drainage below, sheltered from the prevailing winds and sun. Here were beautiful, sustained, aesthetic lines more at home in New Zealand or the Alps than the rounded, forested slopes most people associate with Hokkaido. For someone who's prone to saying dorky things about "drawing inspiration from the mountains", this was an almighty kick in the pants. Hokkaido had big mountain lines! I stood in the bright sun and freezing wind on the observation deck and stared at ski lines through one of those fixed telescopes until my eyes ached and my hands were numb. On the gondola ride down, I stood by the window and stared at the sun-lit headwall long after another ridge had slid past to hide it from view. Later that day, I slipped on ice walking down the street and my knee collapsed. I couldn't walk for the rest of the trip and flew home a few days later. I came home from that trip with a serious limp, a resolution to never go to an izakaya in a time of serious hunger, and a fascination with big mountain skiing at Kurodake. No one I talked to had skied those lines. How did you get to the top? Could you ski all the way down or were there impassable cliffs? Did they hold enough snow to ski? And if you did finally get into the valley floor below, could you follow it back to town, or were the sides too steep? Google Maps and image searches proved comprehensively inconclusive. For the rest of the year, when people asked about my trip, I could only incoherently exclaim "Kurodake! Might be incredible! Maybe. Or horrible." Pete has stoically sat through hours of this. Since I arrived this season he has regularly emailed me to ask if I’ve checked it out. It’s been a difficult waiting game: The ropeway shut down just after I arrived, and only fully reopened on the 20th of February. And skiing committing lines like those I’d seen requires the right combination of weather, snow conditions and skiing partners. Finally, last Thursday, the planets aligned. 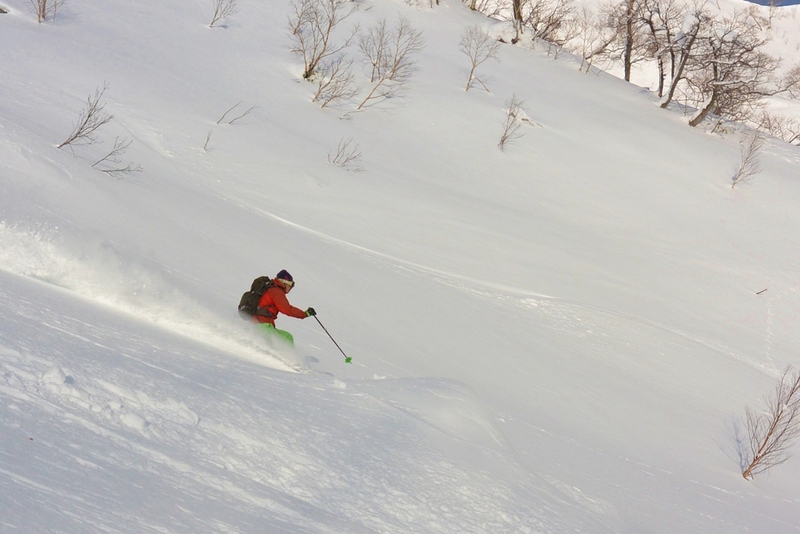 My brother James and I had skied Furano during a decent sized storm on Tuesday, then Asahidake on Wednesday. On Thursday, we woke to still conditions and high cloud, which burnt off as we got off the chairlift and skinned up to the summit. The westerlies which had hit Asahidake pretty hard during the storm hadn’t affected the snowpack at Kurodake, with dry new snow consolidating gradually onto a well bonded snowpack below. After spending a while on the peak choosing and photographing our route, we hiked across the windstripped plateau behind Kurodake and over Keigetsudake, the low sheer-sided bump that guards the top of the Kurodakesawa drainage. We weren’t sure we’d even be able to get onto the ridge that led to our line, but we ended up standing on top of an easy passage that avoided the massive cliffs to either side and soon made our way out to the chute we’d identified. We’d picked out a system of chutes about 700 vertical metres long, running down to a bench another 200-ish vertical metres above the river. The entry was a scrappy sideslip through some trees, followed by a mandatory straightline through some rocks. As James helpfully pointed out, the runout was “steep”; around 60 degrees. Once we had entered the line we would be totally committed, it would be just about impossible to climb back out. The gully to right ended in cliffs several hundred metres high, and the lines to the left were completely unknown. In these situations you try to get as much information as you can on what you’re about to get into – we’d scoped and photographed as much of the route as we could, I’d previously skinned up the valley to check the exit, we’d followed the weather and snow leading up to our visit and checked conditions on a similar aspect on the skin up. But this never really tells you what it will be like. There could be impassable cliffs, water ice, unstable snow – you never really know until you get in there and find out. On one hand you’re nervous, on the other hand you have to be confident or you’ll ski badly and crash. You really can’t afford to crash. So we dropped in. Directly below the entry there were small chutes to the left and right. James took the right side while I watched and tucked into a safe point under the dividing ridge. I took the left. On my first turn the snow kicked up into an epic faceshot. Unable to see, I threw in a second turn and felt the ground drop from under my skis until they were just drifting across the snow surface. It wasn’t a cliff – it was just seriously steep. Still in the white room, I knew my sluff had to be coming down after me so I cut right and joined James on the middle ridge. The two small chutes joined and widened out. James took the right-hand-side to avoid the sluffs we’d both kicked off, and once he was safe I took the left. 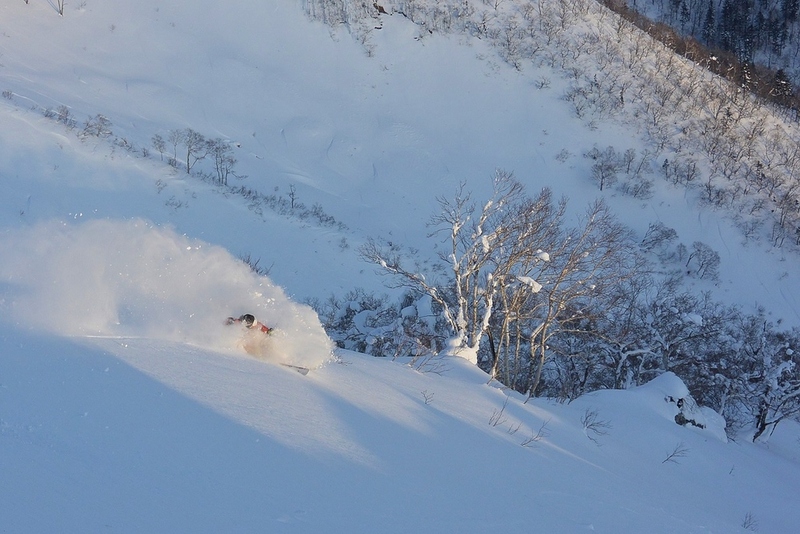 His line, steep powder turns below a sunlit, corniced ridge, with the gnarled cliffs of Kurodake in the background, was one of the most aesthetic I’ve ever seen, and eloquently rebutted the “Hokkaido is flat” crowd. I don’t know what my line looked like, but the snow was so good I got a faceshot every turn, and the pitch so steep my skis popped clear of the snow each time I unweighted. It was as close to the perfect ski conditions as I’ve ever come. We regrouped at another safe point and skied a short, careful pitch above a suspicious looking constriction. It turned out to be a small bluff which we passed by sidling through some trees to the skier’s left. Seeing it from below, you could probably just huck the cliff (it was only 3 or 4 metres), but given the situation I was happy to have played it safe. By now the angle had backed off to around 45 degrees or so. From below the cliff it was just one more pitch to the bench and relative safety. We kept left again to avoid a small gap in the snow that might have been a symptom of thin snow caused by a hot-spring soak, and were finally on flat terrain again. From there it was a quick traverse along the bench and a sharp drop to the valley floor down a line I’d skinned during the route inspection. By mid-afternoon we were back at the gondola, at once stoked by the achievement and a little shaken by the scale and intensity of the descent. On one hand it was probably the biggest, most committing, and most sustained line either of us had ever skied, and conditions had been effectively perfect. On the other hand, the wrong conditions or a serious fall would have been fatal. We only went in there because we were pretty sure that it was safe, but you can never be totally certain about these things. In fact, there’s still a lot I’m not certain about: Does anyone else ski out there? I find it hard to believe that such direct and aesthetic lines haven’t been done before, but I don’t know. Do any of the other lines in that area go through? I think some of the smaller ones do, but I’m not sure. The bigger lines? Well, maybe… It doesn’t look likely to me. Could we have skied directly from the main line to the valley floor, rather than traversing across the bench? Can you even ski down the upper section of the river? Is the line in condition very often? I don’t know. I don’t know. I don’t know. I doubt it. 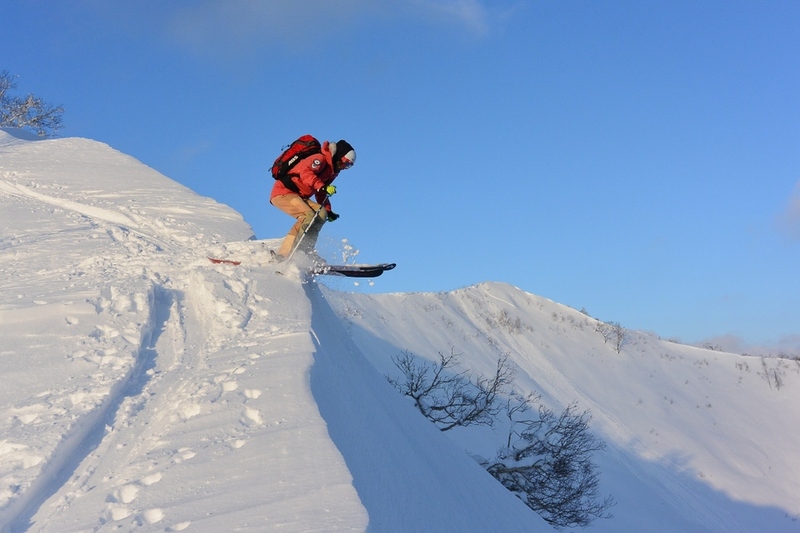 Does one skiable line on one day mean Kurodake is incredible, or was it a freak event? 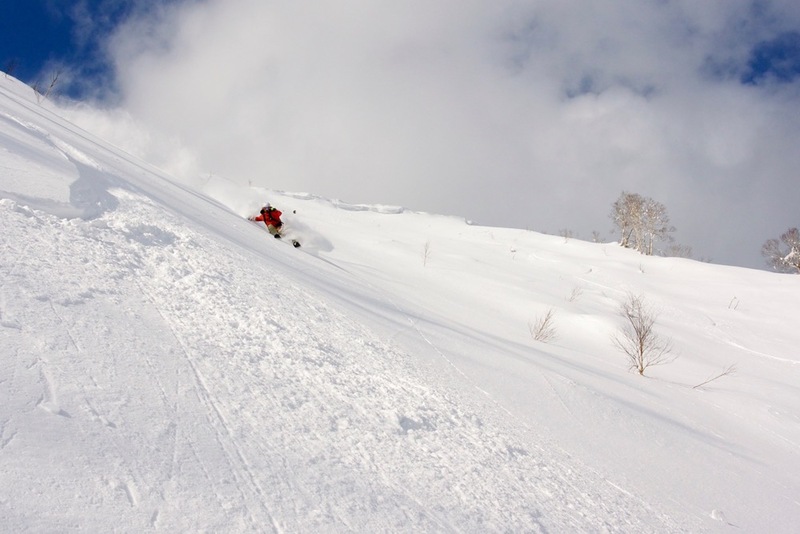 Is Kurodake a steep, technical, 15m-of-powder-a-season dream or a cliffy, impassable, avalanche prone nightmare? I still don’t know. It could be both. All I know is that we skied something amazing, and when conditions and weather and ski partners line up again, I’ll be back. Disclaimer: I am not the world’s greatest skier. I don't need the legions of skiers and boarders around the world who are better than me to make me look like a complete muppet – I can do that all on my own. Every time I go into the backcountry I’m reminded of just how little I know, in a world where folks who have been doing this stuff for longer than I’ve been alive are still learning. So I’m not trying to be an elitist douchebag when I say that for almost everybody who reads this post, you don’t want to go into this terrain. Just getting into the line involves skiing above hundreds of metres of exposure. If you drop in and there’s an avalanche you’ll die. It’s a 700 vertical metre terrain trap. They won’t find your body until June. If you have any kind of serious fall you’ll get badly hurt or die. If you’re hurt, you’re a very long way from help. If I have to tell you to ride within your ability or practise safe backcountry travel techniques or carry and be proficient in the use of a beacon, shovel and prove this really isn't the place for you. This area isn’t a hidden gem or an adventurous challenge or any of the other puff you read on marketing websites. If you’re a serious rider and you know what you’re doing and you climb mountains and ride difficult lines this will probably be easy for you. You'll probably laugh at me for being scared at the top and taking the whole thing so seriously. I hope this post gets you interested and that you visit this area and get conditions as good as we had. Be safe. Maybe you can help to figure out whether Kurodake is a dream or a nightmare. For everyone else – there’s great skiing on the face below the peak and under the gondola. Respect the mountains. 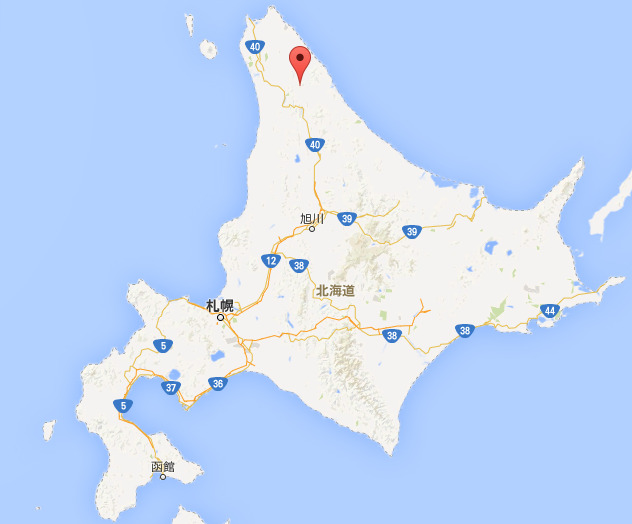 I had just pulled up at the onsen after a day of skiing at Kokusai, an hour or so west of Sapporo, when the message came through from Goro-san: "Pinneshiri is 8:30 set in [with the Google map on the right]... Very far. All right?" "Very far" was accurate. Pinneshiri was a good five hours from Kokusai, and that included taking the toll roads to skip the Sapporo traffic. To get there by 8:30 the next morning was going to be a mission. But Goro-san's recommendations are not to be take lightly. 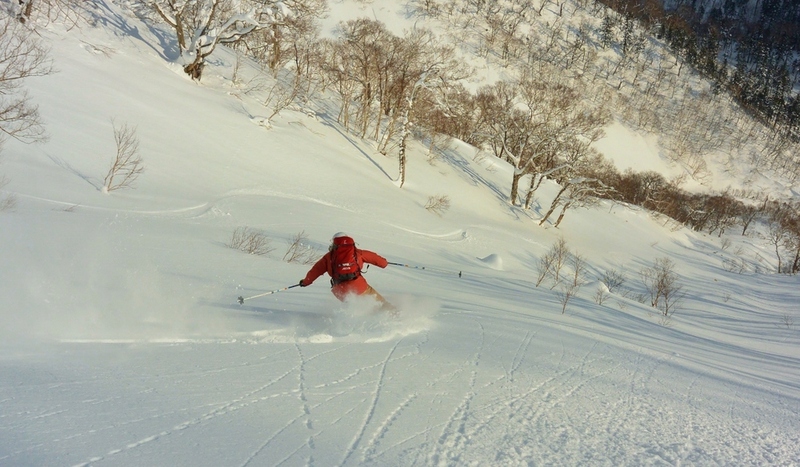 He's been living and skiing in Hokkaido all his life. Six days a week he's the cool and collected proprietor of Cafe Nomad (カフェ　ノマド） in Higashikawa. On the other day he rips. I smashed a quick bowl of yakisoba and hit the road. At 5:30 the next morning I met Goro-san and T (short for Trygve - a hard charging Norwegian guy who's coaching nordic skiing in Higashikawa) outside Cafe Nomad. We all piled into the into the bus and drove due north. Goro-san had called up a friend from the area to join us for the day. Kougami-san is apparently notorious for his epic road-biking exploits during the summer, and shortly after meeting us at the car park he set about pleasantly destroying us all on the skin track. At least I didn't feel guilty about not breaking trail. Now, the details are little hazy because of the language barrier, but as I understand it, Kougami-san "found" this mountain just four years ago. Before that, it doesn't sounds like anyone was skiing there. It's 10 minutes from his house and he's been guiding, hiking and dropping lines there ever since. It's basically his mountain, and it was a real privilege to ride there with him for the day. In perfect bluebird weather he showed us the best snow on some sheltered southern aspects. The terrain is fun without being intimidating, the snow was super dry after the clear conditions overnight, and the skiing was awesome. A good crew, in great snow, on a beautiful mountain, with no-one else in sight. Basically the perfect day. To the north we could see the Sea of Okhotsk, and to the west we were looking out towards the Sea of Japan. With the ocean on three sides, Pinneshiri gets a lot of wind, but for us it was perfectly still. They don't call Goro-san "Mr Bluebird" for nothing! We headed down in the soft light of the late afternoon and grinned at each other like idiots in the car park. Kougami-san headed off, and the rest of us went to the onsen, which was literally just over the road (I've reached the point where this seems completely predictable and normal - it's Hokkaido). Then it was back into the van and a stoked, quiet drive back to Higashikawa. Skiing has plenty of good days, but there are just a few days that are better than good, that stand out in your memory. Pinneshiri was totally worth the drive.